This is a tale of two books.Some questions in this book, such as the first one: "I don't know if I believe in God, I mean, who made God anyway? ", are antagonistic. These questions are illustrated with older children in hostile/ aggressive poses oozing attitude. I didn't appreciate the tone or illustrations of children in need of an attitude adjustment. The questions themselves could have been asked in a different manner that would have engaged the substantial aspects of these inquiries without the expression of rebellion. Other questions are whimsical expressions of childhood curiosity, such as "How big is God?" and are illustrated with bright-eyed, inquisitive children. While it is true that much of our theological foundation stems from the Genesis account, this book is best when dealing with questions more directly related to Genesis. While some of the questions are cute, and all of them are pretty engaging, there are so many other resources to deal with other inquiries.I am extremely pleased with the first two installments of this series. They make a unique contribution to our thinking and are focused on the specific questions that arise from a study of Genesis. However, I could have passed on the last two, including this one. But, since we have it, I will keep it and use it, though not as intentionally as the first two. 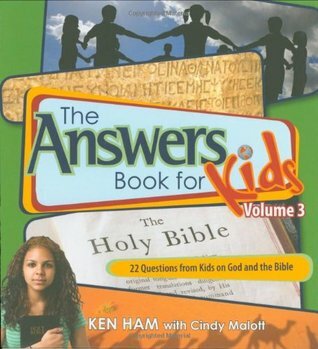 Ken Ham Cindy Malott - Dr. Ken Ham is the president of Answers in Genesis USA and is a well-known speaker and author on the subject of Young-Earth Creationism. He received a bachelor degree in applied science (emphasis on environmental biology) from the Queensland Institute of Technology, and a Diploma of Education from the University of Queensland. He has also received two honorary doctorates: a Doctor of Divinity from Temple Baptist College, and a Doctor of Literature from Baptist Liberty University.He was a director of Creation Science Foundation (CSF) in Australia, an organization which he jointly founded with John Mackay. In 1987 he moved to the United States, still maintaining his links with CSF.From 1987 to 1993, Ham worked for the Institute for Creation Research, and in 1994 set up what in 1995 became Answers in Genesis (AiG), a creation ministry dedicated to "upholding the authority of the Bible from the very first verse. "In 2008 Ham was described by well known atheist and evolutionary biologist PZ Myers as a "Wackaloon" for carrying out a prayer session with members of the Pentagon. Ham responded regarding the validity of that prayer breakfastand that PZ Myers and other critics were intolerant of his position.